We were delighted that so many people attended the memorial event for our founding trustee Bridget Allchin at Wolfson College, Cambridge, on Saturday 17 March. The occasion, attended by Dr Allchin’s family, friends, colleagues and students, and fellow trustees, was hosted by the Trust, in cooperation with Wolfson College. The event was introduced by Dr Gordon Johnson, former President of Wolfson College, and Professor Nicholas Sims-Williams, Dr Allchin’s successor as Chair of the Trust. This was followed by a fascinating talk by our former trustee Professor Michael Petraglia, now at the Max Planck Institute for the Science of Human History in Jena, Germany. 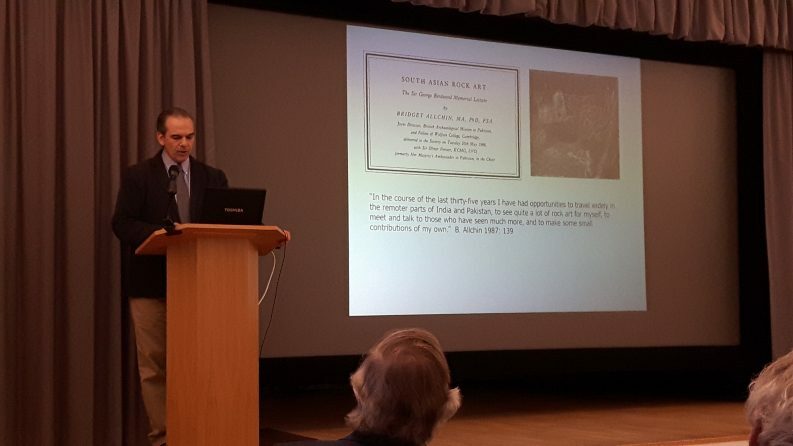 ‘Following in Bridget Allchin’s Footsteps: the Current State of Stone Age Archaeology’ paid tribute to Dr Allchin’s pioneering contribution to the field of South Asian archaeology and prehistory, tracing the scholarly developments and debates that have followed this work. The talk, perfectly pitched for a mixed academic and non-academic audience, looked at three key areas of Dr Allchin’s work: the earliest colonisers; environments and modern humans; and hunter-gatherers before agriculture. The first part discussed the discoveries made about the earliest settlers in South Asia, perhaps dating back 2 million years, by the British Archaeological Mission to Pakistan (1981-1991), directed by Bridget and Raymond Allchin, and Professor Robin Dennell. 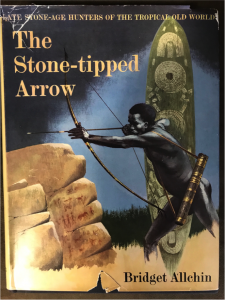 The third part of Professor Petraglia’s talk opened with the eye-catching cover image of Dr Allchin’s 1966 book, The Stone-Tipped Arrow: The Stone-Age Hunters of the Tropical Old World. From here we journeyed through Dr Allchin’s and her successors’ archaeological studies of weaponry and rock art, as well as touching on bees and honey in the Bilasurgam Caves, which have now been carbon dated to 3000 BC, and which Bridget and Raymond Allchin travelled to by bullock cart in 1957. Integral to the ground-breaking work of the Allchins was an attitude of always re-evaluating the methodology and techniques used in their field. As Bridget put it: “After my first visit to India in 1951-2 I became increasingly aware of the urgent need for modification of the … classification of pre-Neolithic cultures”. And, as they both stated in an interview in 1998: ‘We must be prepared for changes of approach and changes in the types of jobs available. There has to be a move away from large excavations to problem oriented archaeology, exploring all kinds of new techniques and methods of analysis’. This forward-thinking attitude and lifelong commitment is also evident in the establishment of the Ancient India and Iran Trust, with fellow founding trustees Sir Harold Bailey and Joan and Jan Van Lohuizen, and its continued growth 40 years on. The Allchins worked tirelessly to develop the Trust and ensure that it maintained its position as an independent, invaluable resource for the study of early South Asia, Iran and Central Asia. 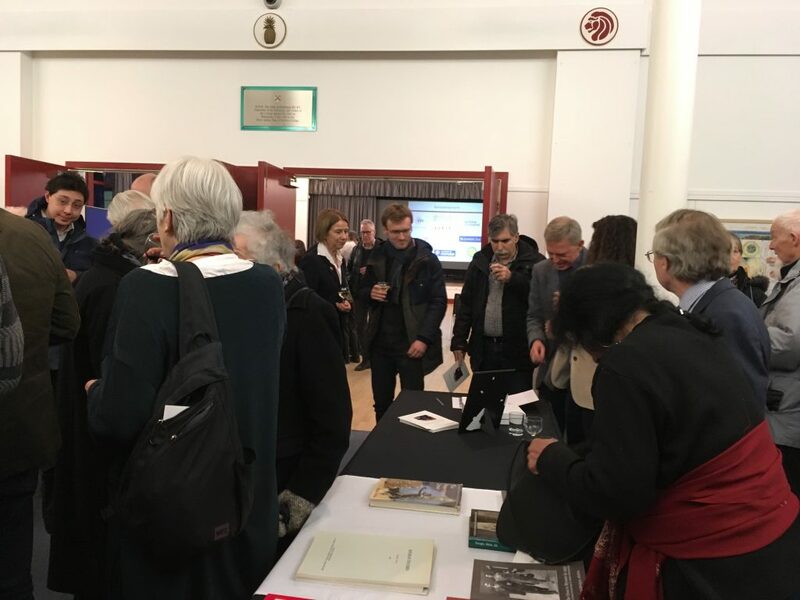 The buzz around the display of Bridget Allchin’s publications at the reception after the talk reflected how a life driven by constant inquiry, discovery and sheer determination had, deservedly, been celebrated to the full. The liveliness of the occasion was something she would have appreciated.